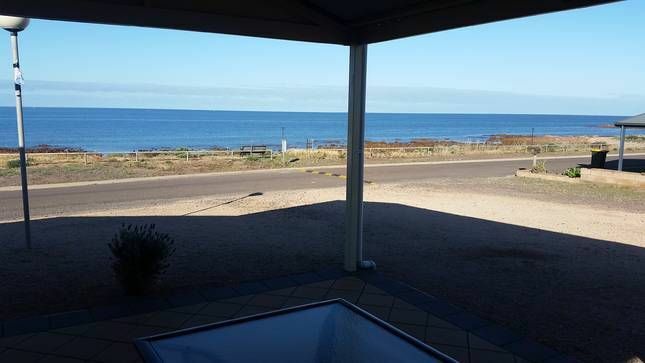 Sunset Unit is the perfect and most AFFORDABLE holiday destination, located on South Australia's beautiful North Beach Wallaroo Yorke Peninsula. Located less than 2 hours from Adelaide. The Unit sleeps 4 persons with two bedrooms with (main overlooking sea) and roomy living area and sunroom, Feel free to use the pot belly stove during winter (byo wood ) or discuss with owner Frank. Sunset units also caters for those busy couples that want to have break and relax for few days in very QUITE AND PEACEFUL SPOT..
Accommodation is fully self contained with reverse cycle air-conditioning and offers everything you need for a relaxing self catering escape. Best Customer service in YP with passion to make your Holiday best ever ...come and see us we Love to see you soon , if you have any request for the period with us please contact me and will plan your wish . PETS are allowed if approved by owner...if you have pet contact Frank for approval. Everything we needed was provided . Great location and view. Extremely tidy and well-kept. Very, very bad customer service on your part HomeAway. No contact by your company to let myself know the code for the key for entry of sunset units. Paying $100 in advance and that is a refund amount after your stay for any damages. Pretty poor I had to make contact with the owner two weeks after our stay to get the $100 refunded back to me. Call that good business, ah don't think so. HomeAway you won't be getting any further business from me!!!!! Very clean and tidy with everything we needed. Thanks for being so accommodating for our dogs. Lovely little home! We here to give our customers best service possible so they can fully Enjoy their Stay with us . Look forward to see you all again soon. Thoroughly enjoyed our getaway in a most beautiful part of the world. Owner has taken care to ensure that every need is met. Peaceful, private and well appointed. Highly recommend. Thank you Mary for straying with us and hope you had great holiday ... We here to service and give our customers best value for money. Thank you for the wonderful review and look forward to see you all again soon. How wonderful to open the master bedroom blinds and watch the ocean in the morning. Literally across from the water and sand. Quiet neighbourhood. Accomodation had everything we needed. The slow combustion fire was loaded and ready to go, which was very thoughtful. Nice bed, great hot shower, lovely private yard and open front covered seatibg area. Love the sun room too. We are so happy to have found this place. Look forward to staying again.